Belmont’s 16th annual Family Literacy Day, an event that invites families from the Nashville community to read with Belmont students and promotes literacy for the whole family, brought nearly 230 student volunteers together on Saturday, April 9. With more than 200 community members registered for the event, 2016 Literacy Day was the largest one to-date. Student organizations, campus departments and individual volunteers created reading groups, centered around a theme and invited attendees to join their station for a book or two. The event’s festivities celebrate d the joy of reading by encouraging children, and their parents, to enjoy literacy together. It also raised awareness around some of Nashville’s literacy—related resources including Books from Birth, Ride for Reading, Nashville Adult Literacy Council, Metro Public Library, Book’em and the Pencil Foundation, among others. 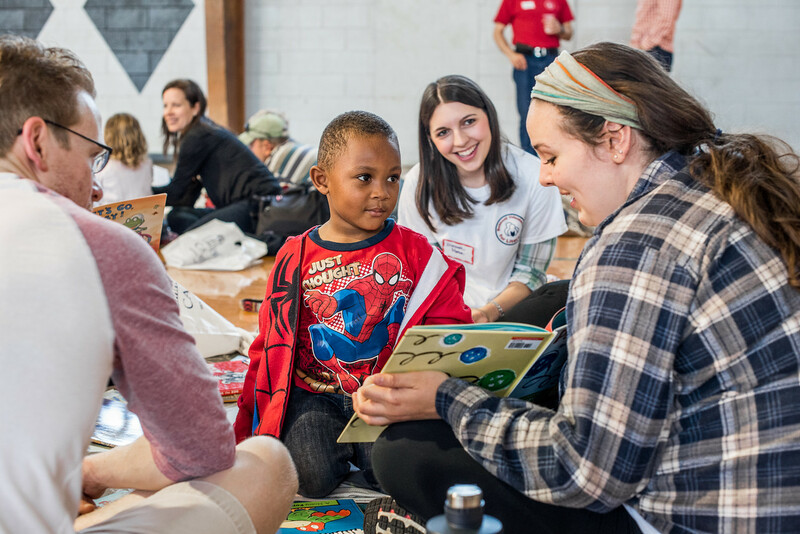 While the event is organized by Stewart and the Belmont Volunteers for Literary student organization, a number of organizations joined efforts this year to partner with the team. Stewart said he is very grateful for the partnership of so many community organizations who come together to host Literacy Day. The event serves as a family friendly celebration for community members who live within the Rose Park neighborhood, but above all, it provides an opportunity for children to experience education in a new way. Allowing students to read outside with college students and receive prizes for doing so continues to encourage literacy and the chance for students to strengthen their reading skills. “Family Literacy Day is very rewarding to see. The smiles on the faces of the children, their parents and our students make it all worthwhile!” Stewart said. For more information on the event and the Belmont Volunteers for Literacy organization, click here. For more photos of the event, click here.